Sustainability has come to dominate our everyday lives like no other concept. From climate change to resource scarcity, right through to food security, various global challenges lie at the heart of the political-social discourse. Companies will be increasingly held accountable in this respect. On the other hand, the economy itself is required to adapt to these changes within its own business environment. The goal is sustainable competitiveness. As a consequence, the concept of sustainability has developed from what was originally a “green idea” into a clear-cut management theme – here the “social case” becomes part of the “business case”. In our view, sustainable management is closely linked with business success. In doing so, sustainability management by no means restricts the business activities. Quite the opposite: New entrepreneurial potential can be created from the apparent contradiction between responsibility and profitability. We view sustainability as a strategic management approach. To this end, all ecological and social measures need to meet and optimize the core business of the company. The basis for this is the integrative view of all functional and business areas. Based on a clear strategic understanding, this extends from the supply chain and raw materials management to organizational aspects, right through to suitable communication and marketing measures. One of the main challenges here is the ongoing scrutiny of the company´s concept of sustainability and the product and service portfolio as well as adapting to the requirements of the market. Each project differs in various ways from another and therefore needs individual planning. For this reason and depending on the project’s content and scope, we select a suited project team which can consist of students, lecturers and professors or also external consultants. The team works closely together with the client to develop a goal oriented and professional solution. 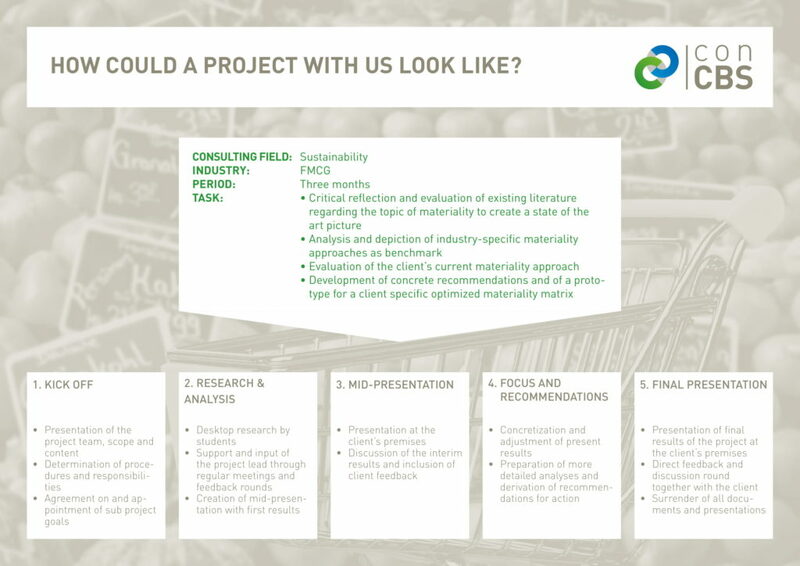 How a project could look like and which general steps it contains will be shown in our one-pager “sustainability”.